The stereotypes are familiar: unemployed twentysomethings living in their parents’ basements, senior citizens trotting off to retirement communities in sunny states – or occupying rocking chairs on the porch of the family home. But new economic realities and changing social dynamics are putting a new spin on the old pictures. 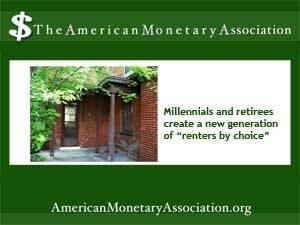 Now, millennials and retirees are at the forefront of a new trend – renters embracing the mobility and flexibility of not owning a home. Conditions for baying houses remain pretty favorable in spite of slowly rising interest rates and home prices, and more stringent requirements for mortgage applicants. Even so, the number of renters continues to rise. And while some have been forced out of homeownership because they lost a home to foreclosure in the housing collapse, or because they simply don’t have the finances or creditworthiness to support a home loan, it’s the under-40s and over-60s who are choosing to rent for the long term. Student loan debt is one factor that keeps some millennials and others in their general age range from buying a home or taking out a loan on other big-ticket items, but that’s not the whole story. For many young professionals the ability to be mobile is a major career asset. Being able to relocate for a job looks good on a resume and enhances hireabilty in some fields. And while a significant number of people in this group say they’d like to own a home someday, the emphasis is on “someday,” when they’re ready to settle into a stable career and have a family. On the other end of the generational spectrum, a growing number of retirees are choosing to rent for the same reasons: mobility and no need for a family friendly home. In some markets around the country, those larger, post-starter homes are hitting the market as their owners opt to travel or downsize to accommodate an empty nest. Increasingly, members of this age group are abandoning suburbia for the city, too, citing easier access to services and better access to events and activities. And they also want to be mobile, with the option to move easily at short notice. What’s Ahead for Fannie Mae and Freddie Mac?